Form 888 Statutory Declaration is necessary for an Australian citizen or permanent resident in case he or she is going to be a witness to a relationship of the visa applicant and their partner. The person should be at least 18 years old and know the visa applicant and their partner enough time. In case this person isn’t a permanent resident of Australia the form does not bear any value. How to fill out Form 888 correctly? The Department of Immigration and Citizenship must trace the whole way of a relationship to avoid the possibility of the fictitious marriage registration in order to obtain Australian citizenship. That’s why it is important to ask a witness to confirm the verity of a relationship. The person selected for this matter should fill out the Statutory Declaration. This blank form doesn’t need any additional supporting documentation. It can be created during the process of the applicant’s visa formalization. Remember to sign the form after its completion. 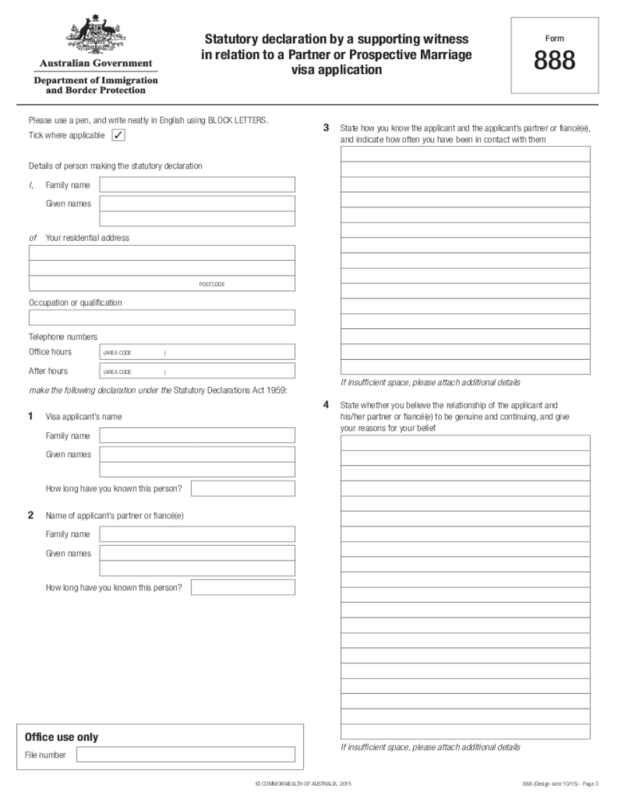 Print the document to send or forward it online directly to the Department of Immigration and Citizenship.